Wee Blue Swirls: Guest Designer - Tag You're It! 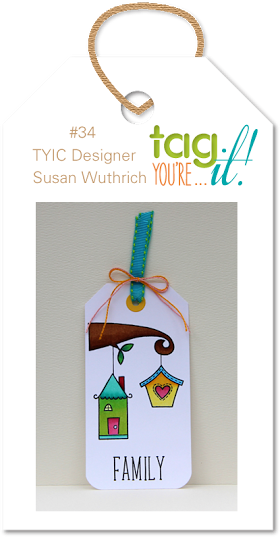 Anyway, the inspiration for the challenge is this cute tag by Susan. I love these sweet little bird houses and I had so many ideas for my tag. I hope you are inspired to play along too. Thanks so much for visiting, hope to see you again soon. ACK! Andrea, your mushroom house has planted a smile allllll over my face! Your colouring is amazing; your selection of an image, absolutely delightful; the 'homey' scene, heart-warming. And the little 'tree house' mushroom house...oh my! Beyond adorable! Thank you so much for being an outstanding, inspiring guest designer; thrilled you joined us at Tag You're It! Wonderful image and colouring! I hope you made it home ok. Thanks for the fantastic inspiration you provided at Tag You're It! Beautiful tag...I'm glad to hear you travel with stamps and markers :) Thanks for designing with us! Lovely tags, I simply adore the mushroom one, it is so cute, thanks for playing with us at ATSM. Oh how cute! Great coloring work on the tag!